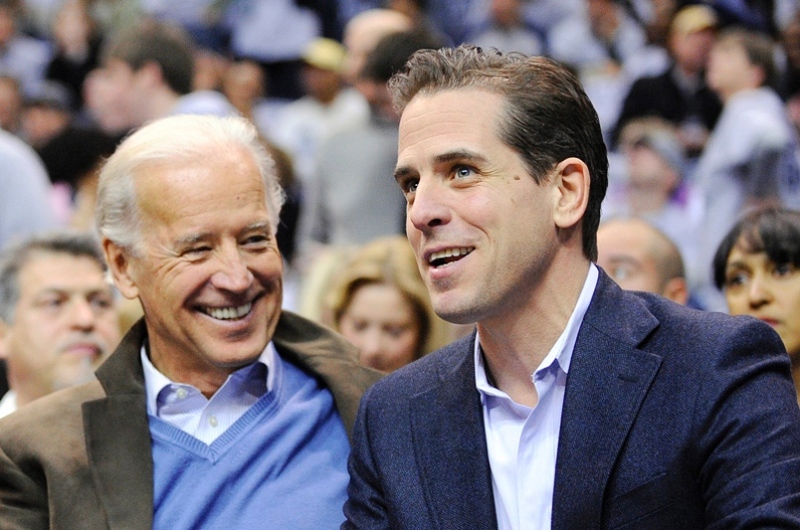 Everything you need to know about Beltway nepotism, corporate cronyism and corruption can be found in the biography of Robert Hunter Biden. Where are the Occupy Wall Street rabble-rousers and enemies of elitist privilege when you need them? Straining their neck muscles to look the other way. The youngest son of Vice President Joe Biden made news last week after The Wall Street Journal revealed he had been booted from the Navy Reserve for cocaine use. His drug abuse was certainly no surprise to the Navy, which issued him a waiver for a previous drug offense before commissioning him as a public affairs officer at the age of 43. The Navy also bent over backward a second time with an age waiver so he could secure the cushy part-time job. Papa Biden loves to tout his middle-class, “Average Joe” credentials. But rest assured, if his son had been “Hunter Smith” or “Hunter Jones” or “Hunter Brown,” the Navy’s extraordinary dispensations would be all but unattainable. Oh, and if he had been “Hunter Palin,” The New York Times would be on its 50th front-page investigative report by now. Despite the disgraceful ejection from our military, Hunter’s Connecticut law license won’t be subject to automatic review. Because, well, Biden. Biden’s bennies are not just one-offs. Skating by, flouting rules and extracting favors are the story of Hunter’s life. Hunter’s first job, acquired after Joe Biden won his 1996 Senate re-election bid in Delaware, was with MBNA. That’s the credit card conglomerate and top campaign finance donor that forked over nearly $63,000 in bundled primary and general contributions from its employees to then Sen. Biden. As I’ve reported previously, Daddy Biden secured his custom-built, multimillion-dollar house in Delaware’s ritziest Chateau Country neighborhood with the help of a leading MBNA corporate executive. Average Joe went on to carry legislative water for MBNA in the Senate for years. Hunter zoomed up to senior vice president by early 1998 and then scored a plum position in the Clinton administration’s Commerce Department, specializing in “electronic commerce” before returning to MBNA three years later as a high-priced “consultant.” While he collected those “consulting” (translation: nepotistic access-trading) fees, Hunter became a “founding partner” in the lobbying firm of Oldaker, Biden and Belair in 2002. William Oldaker was Papa Biden’s former fundraiser, campaign treasurer and general counsel — a Beltway barnacle whose Democratic machine days dated back to Teddy Kennedy’s 1980 presidential bid. Under Oldaker’s tutelage, Hunter lobbied for drug companies, universities and other deep-pocketed clients to the tune of nearly $4 million billed to the company by 2007. Coincidentally, then-Illinois Sen. Barack Obama personally requested and secured cozy taxpayer-subsidized earmarks for several of Hunter’s clients. Hunter got himself appointed to multiple corporate board positions, including a directorship with Eudora Global. It’s an investment firm founded by one Jeffrey Cooper, head of one of the biggest asbestos-litigation firms in the country. SimmonsCooper, based in Madison County, Ill., donated hundreds of thousands of dollars to Biden the Elder’s various political campaigns over the past decade — all while the firm poured $6.5 million into lobbying against a key tort-reform bill, which former Sen. Biden worked hard to defeat. Cooper also contributed to the Delaware attorney-general campaign of Hunter’s older brother, Beau, and paid Beau for legal work on lucrative asbestos-litigation cases. Hunter also was previously a top official at Paradigm Global Advisors, a hedge fund holding company founded with Vice President Biden’s brother, James, and marketed by convicted finance fraudster Allen Stanford. As Paradigm chairman, Hunter oversaw half a billion dollars of client money invested in hedge funds while remaining a lobbyist at Oldaker, Biden and Belair. Cooper chipped in $2 million for the ill-fated venture, which went bust amid nasty fraud lawsuits. Continually failing upward, Hunter snagged a seat on the board of directors of taxpayer-subsidized, stimulus-inflated Amtrak, where he pretended not to be a lobbyist, but rather an “effective advocate” for the government railroad system serving the 1 percenters’ D.C.-NYC corridor. So, where does a coke-abusing influence peddler go after raking in gobs of Daddy-enabled dough and abusing the U.S. Navy’s ill-considered generosity? Back to Cronyland! Hunter joined Ukrainian natural gas company Burisma Holdings — owned by a powerful Russian government sympathizer who fled to Russia in February — this spring. The hypocritical lobbyist-bashers at the White House deny he will be lobbying and deny any conflict of interest. Meanwhile, Just Like You Joe was whipping up class envy in South Carolina last week. “Corporate profits have soared,” he railed, thanks to “these guys running hedge funds in New York,” who are to blame for “income inequality.” You know, like his son and brother and their Beltway back-scratching patrons. The Bidens: They’re not like us. Michelle Malkin is the author of Culture of Corruption: Obama and his Team of Tax Cheats, Crooks and Cronies” (Regnery 2010). Her e-mail address is malkinblog@gmail.com. not a born leader – consider the gene pool. Leadership requires that a standard be set. Biden, give it up and disappear.